By John J. Kelly III, M.D., F.A.C.C. What do I need to do about my diet? This question is one of the most frequently asked by patients after they have had cardiac events. Diet remains the one factor that almost every patient can have an impact on that may lead to good heart-health. What you eat definitely can change your risk of developing heart disease. A heart-healthy diet can stabilize and perhaps even reverse heart disease. I recently reviewed an article prepared by the Mayo Clinic staff. The article provides eight steps that patients can follow to take control of their diet and help themselves to healthy hearts. The first point to consider is portion size. Many of the things that we have been accustomed to doing are not necessarily good eating habits. Overloading our plates, taking seconds, or eating until we feel full can lead to consuming more calories, fat, and cholesterol than we need. Thinking about portion size can be a first step towards controlling our intake of unhealthy foods. Try to load up the plate with more low-calorie, nutrient- rich foods. This includes things such as fruits and vegetables. Try to stay away from the high sodium foods that are common in refined, processed, or fast foods. There are some simple rules that can be applied to our portions. A serving of pasta is only about one-half cup. This is about the size of a hockey puck laying on your plate. A serving of meat, fish, or chicken is 2 to 3 ounces. This is about the size and thickness of a deck of cards. Using these rough guidelines, you can get an idea of what an appropriate portion size is. You can start to make changes that will lead you to healthier habits. It turns out our mothers were right when they told us to eat our fruits and vegetables. They are an excellent source of vitamins and minerals. They are low in calories and provide dietary fiber which has beneficial effects. Fruits and vegetables contain naturally occurring substances that may help prevent cardiovascular disease. Filling up on fruits and vegetables can also steer us away from the higher fat foods such as meat, cheese, and snack foods. We should try to buy fresh-frozen fruit or vegetables, low-sodium canned vegetables, or fruits that are canned and packed in juice or water. We should try to avoid fruits and vegetables that come with coconut, creamy sauces, fried or breaded vegetables, or canned fruit that is packed in heavy syrup. You should be careful with frozen fruits and make sure they do not have a lot of sugar added to them. We need to try to eliminate unhealthy fats and cholesterol in our diet. Saturated and trans fats in foods can have adverse effects on our blood cholesterol and increase our risk or developing coronary artery disease. Over time, cholesterol leads to a buildup of plaque in arteries which increases the risk of heart attack and stroke. These changes in arteries can start at a very young age and progress slowly over time until acute problems develop. Saturated fats should comprise less than 7% of our total daily calories. As a rule of thumb, this would be less than 14 grams of saturated fats if we are taking in 2000 calories a day. Trans fats should be less than 1% of our daily calories. Cholesterol should be consumed in amounts less than 300 mg a day for healthy adults. The best way to reduce saturated and trans fats in the diet is to limit the amount of solid fat that you consume. Solid fat is consumed when we use things such as butter, margarine, and shortening. The fats that are potentially beneficial and more heart healthy include olive oil, canola oil, margarine that is free of trans fat and cholesterol-lowering margarines. This includes products such Benecol, Promise, Active, or Smart Balance. Trans fats that we want to limit include butter, lard, bacon fat, gravy, cream sauce, non-dairy creamers, coconut oil, palm oil, cottonseed oil, and palm kernel oil. Low fat protein sources are another choice that we should be making. This includes lean meat, poultry, and fish. Low fat dairy products, egg whites, and egg substitutes are also good sources of low fat protein. We can all make the simple step of removing the skin from chicken before we eat it. Soy beans and soy products are another source of low-fat proteins. When buying ground meat, try to pick the leaner cuts of ground meats. The other sources of protein are certainly enjoyable but we need to limit our intake. This includes limiting our intake of organ meats such as liver, and then other products such as egg yolk, fatty and marbled meats, spare ribs, cold cuts, hot dogs, sausages, bacon, and any fried or breaded meats. Sodium intake can contribute to high blood pressure. Hypertension is a known risk factor for cardiovascular disease. Reducing sodium intake remains an important part of a heart smart diet. We should try not to consume more than 2,300 milligrams of sodium a day. That is about as much salt as can be held in a teaspoon. Certain patients need to reduce their sodium intake even more. This includes any of us who are 51 and older, African-Americans, those who already have hypertension, those with diabetes or anybody with chronic kidney disease. It is important to realize that not putting salt on our food once it comes to the table is a good first step in reducing our sodium intake. We also need to realize that there is a lot of salt in canned and processed foods before it reaches our plate. This includes commonly consumed items such as soup and frozen dinners. Eating fresher foods and making homemade soups and stews reduces the amount of sodium we take in. We need to look at the condiments we use on our food as well. We should try to use low sodium items. Think about using herbs, spices and salt substitutes when you are trying to spice up your foods. Many canned soups and prepared meals come in reduced salt versions and we should try to choose them. Also remember that low salt soy sauce and ketchup are options as well. The Mayo Clinic staff suggest another step in creating a strategy to consume a more heart healthy diet. This is to plan our meals ahead. Using the tips and categories of foods that we have discussed previously can help us make a meal plan. Thinking about things like portion size, lean proteins, avoiding fat and reducing sodium intake provide a framework for planning heart-healthy meals. Never underestimate the need for variety in your diet. This may help you stay on track to a heart-healthy diet. Many of us have fallen into bad habits when it comes to eating. We don’t necessarily take our long-term health into account when we are making day to day choices. Following the tips outlined by the Mayo Clinic staff can lead us to a path where we make better choices over time. These choices can definitely reduce our risk of developing heart disease. It can also help those of us who need secondary prevention after developing heart disease. It won’t be necessarily easy, but it may help us to lead healthier and happier lives. Dr. Kelly has been a member of Cardiology Physicians since 1996. Dr. Kelly grew up nearby the Wilmington area in Delaware County, Pennsylvania. He attended Garnet Valley High School. His family belonged to the Graylyn Crest Swim Club in Northern Wilmington. Dr. Kelly obtained a Bachelor of Arts from Swarthmore College and attended Jefferson Medical College. His post graduate training began with a residency in Internal Medicine at the University of Illinois in Chicago. He served as Chief Medical Resident there. His Cardiology Fellowship was at the Texas Heart Institute in Houston Texas. Dr. Kelly’s recognitions include AOA membership, being named Intern of the Year at University of Illinois and being named Chief Cardiology Fellow at the Texas Heart Institute. He was an Attending Physician at the Christ Hospital in Cincinnati. He received a Teaching Award from the residents at Christ Hospital. He was then an attending physician at Paoli Memorial Hospital and Bryn Mawr Hospital in Pennsylvania before joining Cardiology Physicians in 1996. Dr. Kelly is a fellow of the American College of Cardiology and is board certified both in Internal Medicine in the subspecialty of cardiovascular disease. He has additional board certification in interventional cardiology. 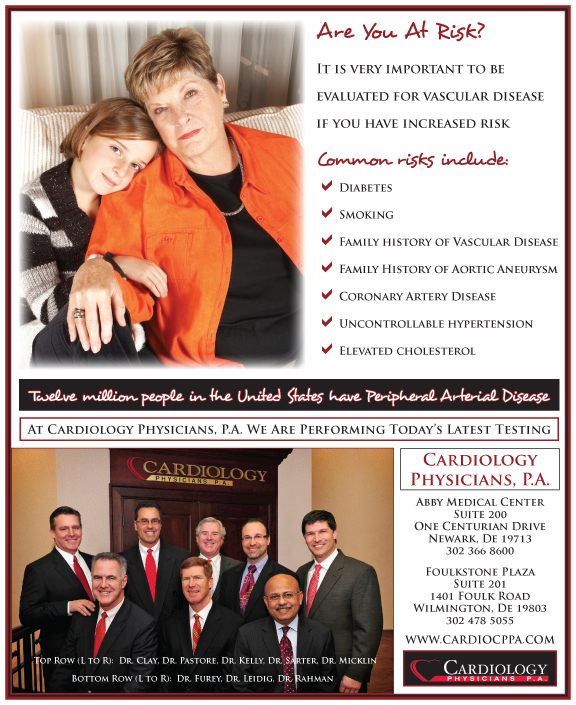 Dr. Kelly has a strong commitment to consultative cardiology and has been in practice since 1991. Dr. Kelly has additional areas of interest including echocardiography, transesophageal echocardiography, stress echocardiography, diagnostic catheterization and catheter based treatment of heart disease. He also has an interest in the treatment of peripheral vascular disease. Dr. Kelly is the Medical Director for Cardiology Education at Christiana Care Hospital. Dr. Kelly and his wife Janice were married in 1989. Dr. Kelly and Janice are the proud parents of Jay and Brooke. Dr. Kelly’s free time is spent enjoying family activities. He spends as much time as possible on the sidelines watching his children compete in various athletic contests. He enjoys chipping in with coaching when able. He tries, without much success, to play golf.